An 8" F8 Dob-mounted would be good. Long but not too heavy. Less stooping and if needed, a shorter platform. Should perform better than a F10 SCT as smaller CO.
Last week I bought a Russian TAL 2 6 inch F8 OTA. Not lightweight through design but only size, like my other CCCP or Siberian stuff, built to last! Excellent finder, I think its eye lens is a TAL Plossl, gems in their own right. Its almost an insult to make it a Dob mount, maybe if I used metal plate... but agricised plank will do with galvanised screws and fixings. Its focuser is only 1.25 fit but part of a classic, so I will keep it on but serviced. Edited by 25585, 16 January 2019 - 06:28 PM. I looked at Edmunds site but they did not have ordinary scope mirrors. Flats yes, but no apart from off-axis. My TAL has a spherical mirror like SW F8 6" Newts. What seems strange to me is that longer, smaller aperture Newtonians would be good in Dobsonian mounts but shorter FL ones are instead. Sure 6 inch F8 are commonplace, but 8 inch F8 would be fine at 64 inches. 10 inch F7 is about it for that size, feet on ground, and not too heavy. Glad to have a 10 F6 (as well as F5). For 12 inch F6 would be OK if transport and storage were simple. Still possible with a solid tube. Edited by 25585, 17 January 2019 - 06:35 PM. I am putting money down this week on an 11" Zambuto FL 63" (F 5.73) quartz mirror , which I should get next year some time. 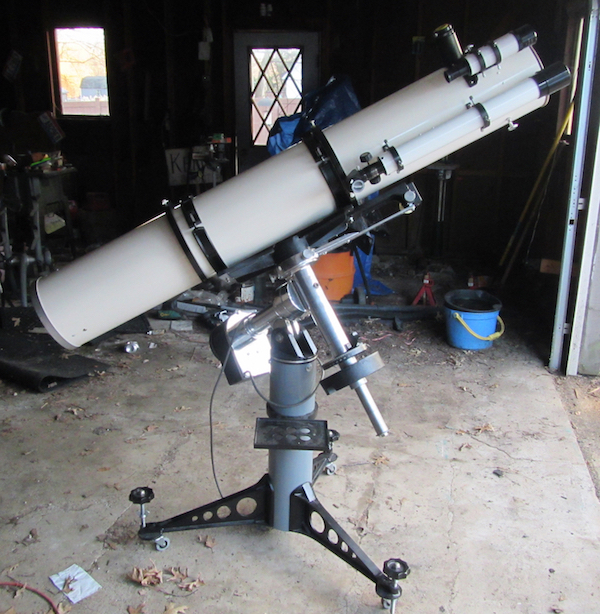 My plan is to mount it in a 12" ID insulated tube as a split tube Dobsonian, with the lower connecting ring acting as a rotating ring, resting against PTFE pads on the cradle. When putting it together for viewing it will have the option of inserting a 9" aperture diaphragm over the mirror to turn it into a 9" F/7 (of course I can also do a 6.3" F/10 if I like). 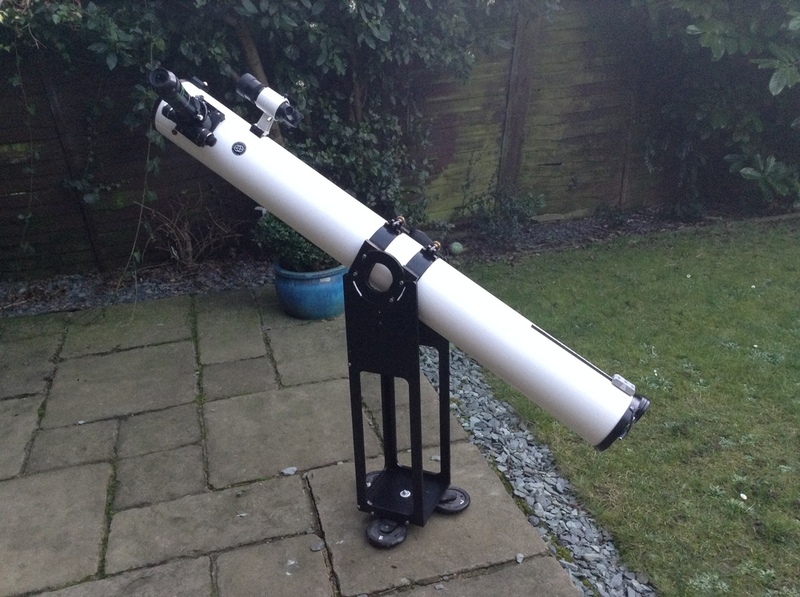 The purpose is to build the perfect "apo killer" planetary scope, which will be comfortable to use: no climbing up on things, rotating for best EP position. I am 70" tall and figure that 63" is about the maximum for comfortable viewing close to the zenith (since I am going to use it on other objects besides planets). I determined the maximum convenient FL and then looked at how wide a tube I was willing to work with, to get the most Zambuto glass consistent with the other objectives. Another factor was that I already have a 13.1" FL 57.4" Swayze mirror truss Dob (very nice), so it did not make sense to crowd that in aperture. PS: An additional advantage of the split tube is that I can have two upper tubes with different secondaries, a 2.14" for F/5.73 mode and a 1.30" for F/7-F/10 planetary mode. I will make two upper tubes when I do the tube construction. Edited by careysub, 20 January 2019 - 11:14 AM. 11 inch mirror in a 12 inch tube might not be good. Had a 12.5 inch mirror in 14 inch tube and found tube wall currents getting in the optical path. Going to do an 8 inch f8 and will use a 12 inch tube to avoid having tube currents in the light path or at least minimize them. Edited by Starlease, 20 January 2019 - 12:40 AM. I've got an 8" f/6 Dob in a 9.5" tube, and that is fine. I do use a single fan behind the primary. A 48 inch long scope will fit in all but the smallest cars. It only takes a few inches and the scope will no longer fit in many cars . The 6 inch F/8, the 8 inch F/6 and the 10 inch F/5 are all optimized for transporting to a dark site in a passenger car . My 10 inch F/5 traveled thousands of miles around the back roads of the southwest . Many of those miles we in the backseat and trunk of a 1989 Nissan Sentra . One problem is getting decent forms with arbitrary diameters for making the tubes (I will be doing a composite construction with 1/4" end grain balsa, with carbon fiber, and 1 mm baltic birch). 12" tubes are easy to get (Sakcrete forms) and the actual ID with that as a form would be 12.5" (using a 0.25" foam sheet taped on to it for easy removal of the lay-up). So it would have a 0.75" gap for the 11" mirror. But in F/7 planetary mode the gap would really be 1.75". Also notice I said "insulated", the balsa is an excellent insulator. I expect this would suppress tube currents from tube cooling, and I would have a fan at the bottom also. Given all this, are tube currents likely to be a problem in either F/5.7 of F/7 modes? Any suggestions for increasing the form diameter another inch or so would be welcome. I will have a year to think on this. A low profile focuser would probably be good enough to compensate for the wider tube. Edited by Galicapernistein, 20 January 2019 - 01:27 PM. I would be interested in observing with one of these scopes. To see if I felt the benefit was there or not. To me, right now, an 8” F8 in a 12” tube sounds a lot like dealing with a 12” Newtonian, but only getting 8” of aperture. Just doesn’t seem like a good deal to me. If one is that worried about tube currents, an open design might be the better option. Having a 10 F5 I agree on the size mattering for solid tubes. But shorter faster seems to be used for truss scopes too. I may very well indeed. One purpose of the project is to investigate this very issue. I had to drill two small holes to install the focuser. Didn’t even remove the secondary, just covered it in plastic; did remove the primary and measure it and blacken the edges with a sharpie (and installed some flocking paper around the primary and across from the secondary). But that was it. I used the top two original holes of the Synta r&p focuser. The GSO is longer, thus the two holes drilled on the bottom. C’est ça. I glued a Rigel base near the focuser and use an Orion 6x30 RA visual finder. I also purchased an Agena 1.25” collimation cap and one of their Blue Fireball 2” extenders (already have a FarPoint secondary laser collimator). This thing is built for speed and the effort to make it so was genuinely minimal. It’s my favorite scope, and I just spent nearly a thousand bucks on a 110mm ED refactor I use less often The SW6 is easily upgraded. Don’t let Orion’s XT 6 with its 1.25” focuser hole constrain you. Step up to 2” reality. It’s way better. I caught most of the eclipse with the Explore Scientific 28mm 68°, but finished up with the Meade 25mm HD-60. 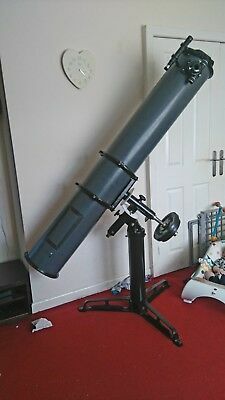 That Meade in the SW6 even split Almach. Didn’t really expect it to, but 48x was enough for the SW6, even on a turbulent, windy West Texas night. And the color rendition was excellent, orange-yellow primary with the small blue secondary — beautiful! It was a tight split, but not a snowman, two stars. This baby’s a keeper. It has ease of use and portability written all over it, and although I can see coma in it, it’s really negligible at F/8. I see all kinds of coma in my 8” F/6, but it’s just not a big deal at F/8. The F/8 parabola throws up one nice image, and that’s a fact! Edited by CollinofAlabama, 22 January 2019 - 03:34 AM. Yes, trading central obstruction for tube currents is a bad trade. I built my last scope using Daniel Mounsey's 1.5" air gap rule, and the results were noticeable. Much more so than fretting over a couple of percentage points of CO. Tube currents never sleep. The bulk is a bit more, but if we are talking about laying a tube across the back seat it is length that matters. Diameter could be 6", 12", or 24" and still fit. Regarding recessing the focuser, I would not get hopes too high on that one. That will of course vary by manufacturer, but I just took a look at my FeatherTouch LW and the space between the focuser knob and the base is maybe 1/4". I could not fit my little finger into the gap. 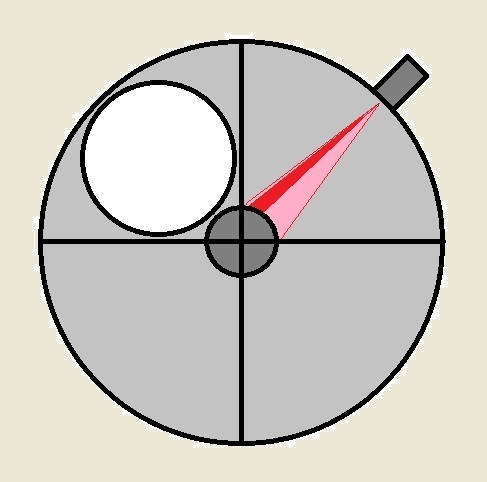 OTOH, this is a thread about long focus Newtonians, and one of the upsides is that skinny light cone has a lot of "throw". That is to say, getting the focal plane away from the longitudinal axis of the scope has a much lower opportunity cost than it would with a faster mirror. With oversize tubes, a good idea in theory, that means needing primary cels with longer reach to your tube's inner walls, unless the appropriate cel can be found that can hold a smaller mirror. Better maybe to use tube material and design rather than increasing dimensions. My very first was like the one below, which had a mirror inspection hatch, thath could be opened to help cooling etc. I would not be comfortable with longer commonly used 1/4-20 bolts either. What I did was make the tube stiffening ring interior to the tube so the cell "saw" a smaller ID. I just re-realized that the many of us who already have Big Fat Dobs, can slap an off-axis stop-cap on and instantly see the effect of a long, slow, obstruction-free reflector. I actually had that on my old, trusty 17.5-inch Coulter. A 6-inch thru-hole stop right on the front, operating at F/13. The planetary images were wonderful. And I could spin the cap around, while looking thru the eyepiece, to find the best-performing part of the mirror/thermals. Now I have a 36-inch, where I could do similar, with unobstructed stop-holes up to 14.5 inches! My 11" F7.2 resides in a 14" tube so I too comply with Dan's 1.5" rule of thumb. And I've no real complaints about tube currents. So, another data point. My 16% obstruction by diameter still gives a decent fully illuminated FOV too, another advantage of the slower FR. As an aside, the OTA, built by Parallax, also has three very nice, tall pegs installed circumferentially about a foot back from the eyepiece. They act as handles to position and rotate the tube, keeping my hands off of the bare metal tube. Now my old AP pre-ED triplets have tube diameters that match that of the aperture and they do suffer from tube currents for a while. Seems most tubes were 1.5 to 2" bigger in OD than the mirror. Parks did make a tube for the 12.5" mirrors and also a 14.5" as it had a OD of 16". But it seems Parks also changed the OD's of their tubes over the years. My 10" Cave is about 12" OD on the tube.